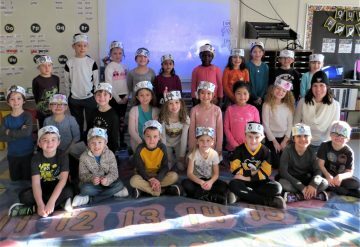 McClellan first graders in Mrs. Santora’s and Mrs. Knopp’s classes recently read the “Ready Freddy” book series in which Freddy and his classmates adopt a penguin. The first graders were excited to learn more about penguins and worked together to adopt their very own penguin through the World Wildlife Fund. As a special adoption celebration and reward to the students for all of their hard work, Mrs. Santora and Mrs. Knopp organized “Antarctic Day” to reinforce additional cross-curricular learning opportunities. The classrooms were transformed into the Antarctic tundra complete with igloos, icicles, snowflakes and clear plastic covering the carpet for ice. Students were engaged in various educational activities reinforcing the Antarctic theme such as writing spelling words in the snow (shaving cream), reading books about penguins and story sequencing, building igloos with marshmallows, making snowflakes using popsicle sticks, participating in a snowball throwing contest and measuring distance, and also experimenting with blubber to see how penguins keep warm. Thank you to Mrs. Santora and Mrs. Knopp for organizing this busy and exciting day of learning!